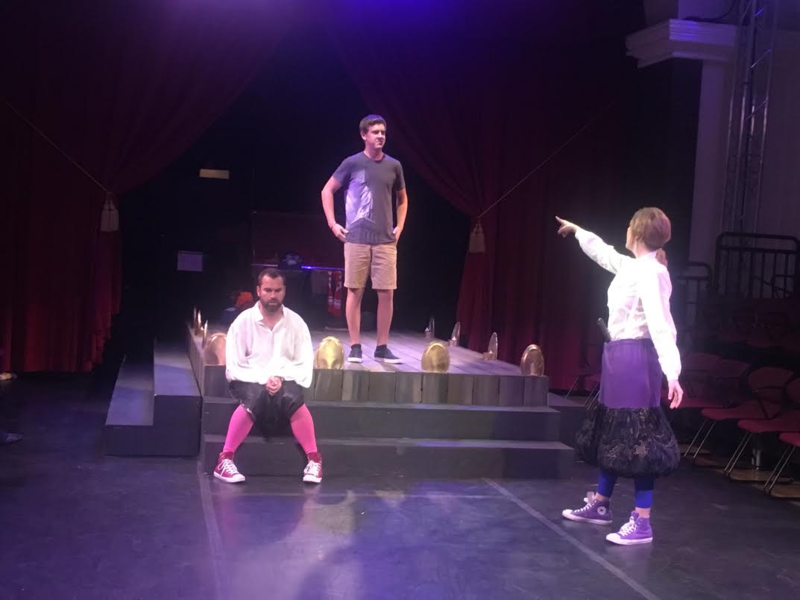 ST. GEORGE — I arrived at the historic St. George Opera House to see St. George Musical Theater’s latest production, “The Complete Works of William Shakespeare (Abridged)” shortly before 7:30 p.m. Monday. I was greeted by a friendly usher at the door who told me the football game was about to start and that the giant screen was set up inside. Having no prior experience with this particular production I had little idea what to expect so I chuckled politely at the kind usher making jokes. This wasn’t Monday Night Football after all … or was it? More on that later. But it just so happens that I love Shakespeare. I walked into the Opera House — St. George Musical Theater’s permanent performance space — armed with my English degree and a generous helping of intellectual superiority. OK, not really, but I do love Shakespeare. Rest assured, whether you love or hate Shakespeare there is something in this production you will enjoy. It isn’t highbrow by any stretch and it isn’t supposed to be. In fact, some parts of the production border on politically incorrect. Then again, it could be argured that so did Shakespeare’s plays. But what the production lacks in what some would call “culture” it more than makes up for in pure hilarity and hijinks; and all with an unflinching nod to “The Bard” himself. 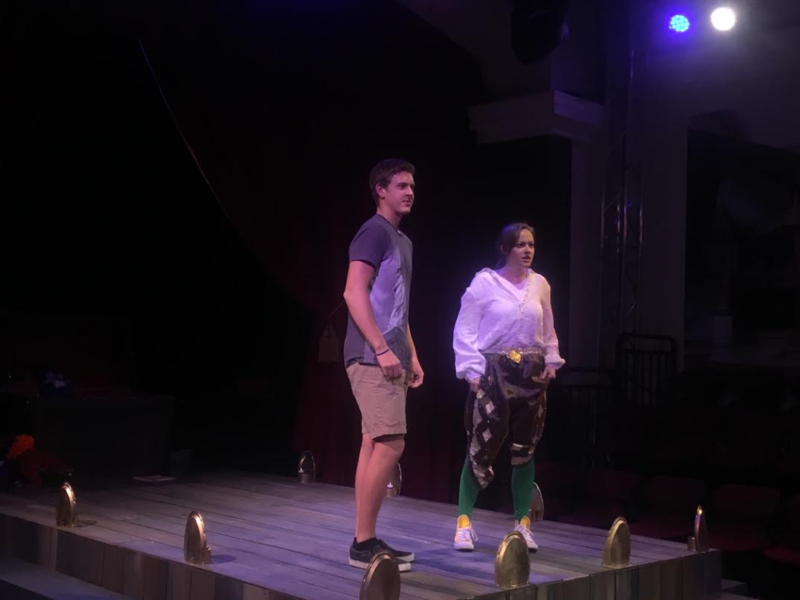 Where “Into the Woods” featured a large ensemble cast that filled the intimate Opera House stage to the brim, “The Complete Works of William Shakespeare (Abridged)” has a cast of only three actors: Anne Falster, Ginger Nelson and Skyler Scott. Without the huge ensemble it becomes incumbent upon Falster, Nelson and Scott to fill what usually seems like a small space. This is where football comes in … sort of. “The Complete Works of William Shakespeare (Abridged)” is an extremely physical play. All three actors take on multiple parts that use their bodies, the stage and the props to the maximum. The cast climbs balconies, dances and dies often. And there is even a real-ish game of football played in which a crown is tossed about in lieu of a ball. If the acting is physical it is nothing to the dialogue which bounces between the language of Shakespeare and the dialect of today at an almost dizzying pace. Anyone who has ever prattled off a Shakespearean sonnet or monologue knows how difficult it can be on the tongue without interjecting the almost urban dictionary speech used in this century’s daily vernacular from one sentence to the next. If there is much critique to be found in the entire production I would say that some of the dialogue is too fast. Patrons who are hard of hearing could have difficulty understanding portions of the production. 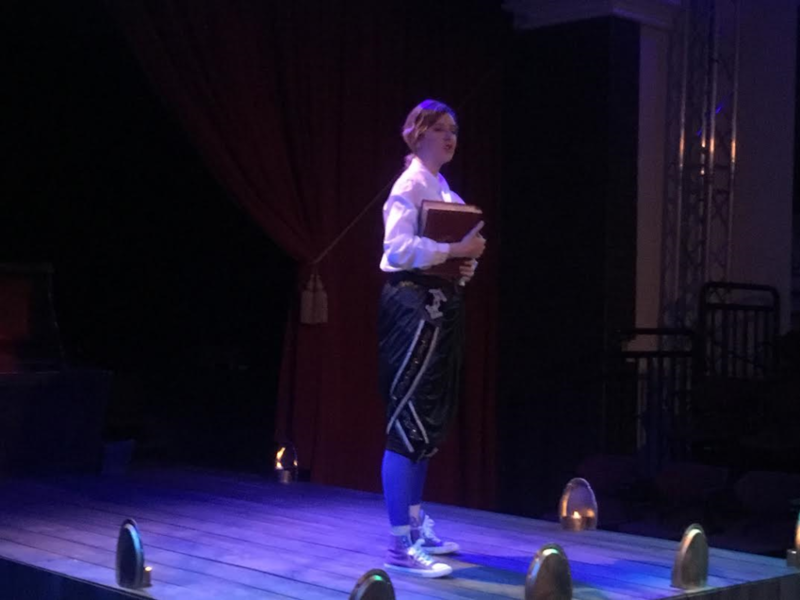 The rushed pace may, in part, be due to the magnitude of what the production is trying to accomplish; 37 Shakespeare plays in 90 minutes and the cast is absolutely terrific at navigating the frenzy and the allotted time. All three are accomplished actors with superb improvisational skills and it is the quick-wittedness of Falster, Nelson and Scott that stole the show for me. I would wager that a guest could see the production at least twice and not see the same exact show. Credit should also be given to the show’s director Trent Cox who clearly gave his actors enough lead to exercise their improv skills yet had the ability to rein them in where necessary. In his play, “As You Like It,” Shakespeare wrote “all the world’s a stage.” It is a phrase completely apropos of this production. 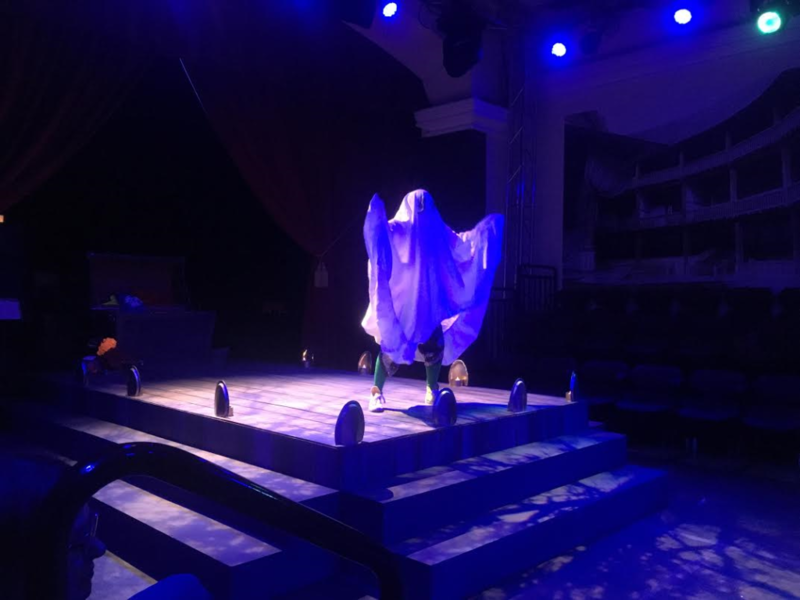 St George Musical Theater continues to raise the bar for community theater by utilizing its famously intimate in-the-round style performance space in new and different ways. For “The Complete Works of William Shakespeare (Abridged)” the seating is almost-in-the-round. In place of one portion of the seating there is a spectacular stage. Granted it isn’t a giant television screen but something more appropriate for an Elizabethan audience … if, that is, the first Queen Elizabeth’s subjects took too many selfies. For me, it felt like the stage and its many, many props was used as a fourth character in the show. 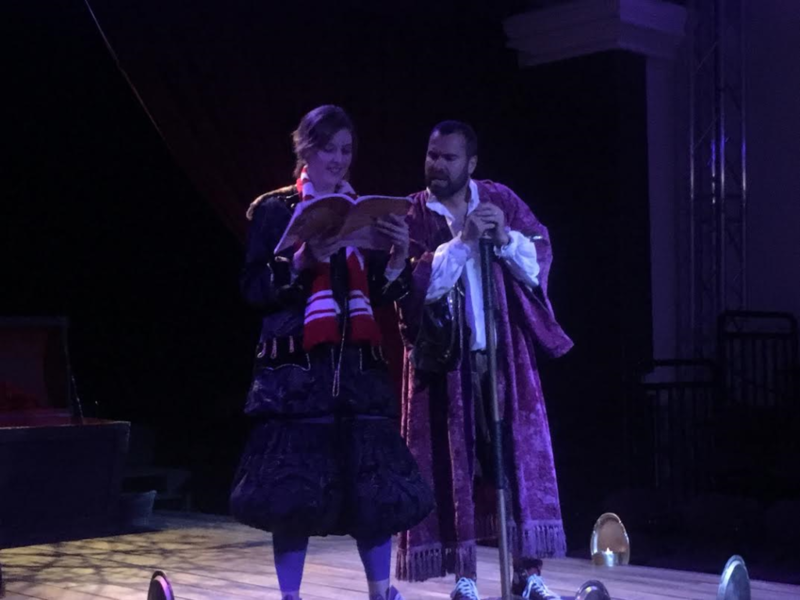 “The Complete Works of William Shakespeare (Abridged)” is an audience participation kind of a production so if you are expecting a quiet evening spent in the relative safety of a seat in a dark theater house, you better change your expectations and go anyway. The way the cast interacts with the guests really amplifies the experience. “The Complete Works of William Shakespeare (Abridged)” runs Thursdays-Saturdays and Mondays at 7:30 p.m. until Nov. 5. A matinee will take place Saturday at 2 p.m.
Tickets are $17-$21 and can be purchased online or at the box office from 6:30-7:30 p.m. on the night of the show. The biggest negative of the entire night was that not enough people came to see the production. I can only imagine the energy levels the cast would have with a packed house. Well that, and my cheeks hurt all evening from laughing too hard. When: Thursdays-Saturdays and Mondays until Nov. 5, 7:30 p.m. | A matinee will be held Saturday, Oct. 15 at 2 p.m.
Purchase tickets: Online | At the box office on the night of the show from 6:30-7:30 p.m.